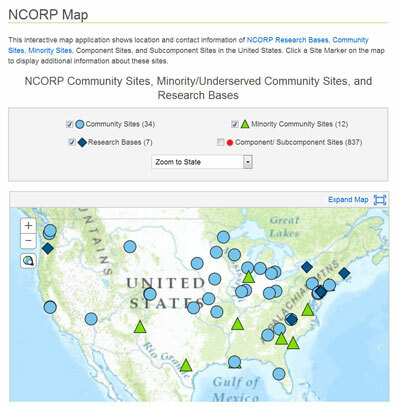 An interactive map of the NCI Community Oncology Research Program (NCORP) with detailed information on hundreds of community sites that take part in clinical trials is available on the NCORP website. This is the first of several enhancements planned for the community clinical trials network website, with a goal of making it easier to find a doctor, clinic, or hospital that participates in cancer clinical trials and studies. The map shows the location and contact information of 34 community sites, 12 minority sites, 840 component and subcomponent sites, and seven NCORP research bases in the United States. By clicking a site marker on the map, additional information about the sites is displayed, including contact information. Selecting a state in the dropdown menu shows all NCORP affiliates within a state, and draws relationship lines to the corresponding community or minority site. NCORP was launched August 1, 2014 as a national network of investigators, cancer care providers, academic institutions, and other organizations that provide care to diverse populations in community-based healthcare practices to conduct multi-site cancer clinical trials and cancer care delivery research studies in communities. The network seeks to identify and evaluate critically needed interventions that reduce cancer risk and incidence, enhance cancer patients’ quality of life, and increase access to clinical trials and cancer care delivery research for minority, rural, and other underserved patient populations.